A fascinating thing about writing books is that I almost never know who’s reading them. I just have to embrace the mystery. 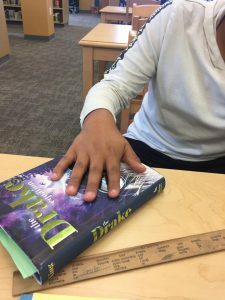 And a fun thing about having a sister who works in schools and libraries is that she revealed part of the mystery today, after a student pulled The Drake Equation out of his backpack to read! Want to read an interview with me at Powell’s Books? Of course you don’t! Are you ready for your Moon shot? Hungry? I made you a tuna sandwich!